Hi John, I've always heard the same thing as you and Greg - that the boat sails fastest on an even keel. When I'm sailing the boat likes to sit on the stringer more often than not. Often, this idea of efficiency on the 'flat' comes to mind and I pull her down flat... it just doesn't feel as fast. Seat of the pants only theorem only... most likely the lean adds more excitement than speed. Ha. The center sponson idea came to me from Mark at Long Haul. But another member here Chris W., has heard about it from David Valverde at BSD. I think Mark may have gotten the idea from Valverde as well. Valverde apparently has put sponsons under the center keel of his boats to round the hull out generating a better sailing shape for the hull and thereby more speed. With the BSD rig and BOSS outriggers this makes sense. I'm not sure there would be an advantage to the center sponson on a boat sans outrigger. It'd be the same as putting the boat over on it's stringer... hoy hoy. Ha. So Mark has taken a Ute sponson which is the shortest length and put it in a nice sleeve with tie downs to hold it in place. I haven't installed it in my AEII yet, but I imagine it's similar to the add-on quattro sponsons I have. You connect the sleeve to one end of the frame, slide it in then do the same on the other frame half. The sponson rides under keel boards. I think Mark told me he uses a pump for the keel sponson, maintaining a balance with the side sponsons so the boat maintains a good shape. If this works, it makes sense that the 'no lean' or 'faster flat' theory is more about sail position than hull position. Thoughts? Seems to me that on a lean or with a rounded hull less surface may be in the water - we're displacement all the way so less would be more... ? 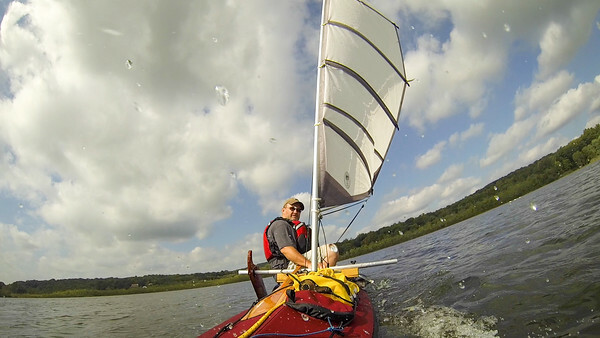 So I had a very amusing time yesterday with the MK1 and BSD sail. It was for the most part a windless day, so much so that when one of my neighbors saw me setting up the sail with a mere ripple on the water, he held up his arms expressing "what the?" I responded that it was plenty wind... and it was. The long and the short of it is that I sailed without the outriggers and used Mark's Hike-out seats as much as possible. With the lack of wind I spent the majority of my time sitting partially on the hike-out seat but more so on the boomerang, the back of the sling seat, and the rear deck bar. I started with the BSD reefed at 22 sq. ft. and ran out my entire GoPro battery in this mode. I had some good moments but it was generally pretty jerky with the gusts. Emboldened by calm water I unreefed to 30 sq. ft. and saw a noticeable increase in the sails effectiveness. The hint of a breeze had me moving. Coming close to actually sitting on the hike-out seat and getting pretty darned hot out there in the light breeze I opted to fly all the sails and opened her up to the full 36 sq. ft.. Within moments I had an ear to ear grin on my face as I was actually out on the hike-out seat sailing. It didn't last long as I quickly ran out of lake. I got another semi good run a short while later and then my phone started ringing, and the school bus alarm started going off and it was time to head in. The sail fully opened is fantastically efficient as far as I can tell. I don't think the breeze I got with the full 36 was any stronger than the wind I had reefed, but the effect was amazing. The boat just took off. Wow, what a blast. I am so stoked to do this again. If the MK1 can do this I have very high hopes for the AEII. So a huge success in my book. The BSD is sailable without the outriggers but it will definitely be a challenge in actual wind. Seems to me that starting and stopping and maybe coming about are going to be the real danger points. Once underway stability increases proportionately with speed. The hike-out seat is golden. It's comfortable and really makes the coaming disappear under your bum. It could use a little padding on the inside of the coaming as I was often bracing against one edge or the other in preparation of moving onto the seat. But to be able to get over that lip without the wooden edge cutting into you makes all the difference in the world. It's pretty darned comfortable to just lean on when you're sitting down in the boat as well. I was surprised once again how quickly the BSD rig sets up. It really is a clean efficient design. On the other hand, I had a lot of trouble getting the battens to reverse position when the sail was reefed at 22 sq. ft.. I had to use the canoe paddle every time I came about to push the battens to the other side. I did loosen the tie downs on the leach of the sail and that helped a bit. Looking at the video it appears that I may not have had the downhaul pulled tight enough... but the sail does get pretty thick in the section where it's folded over on itself twice. It made me think of trying the sail without the battens if I know I'm going to stay reefed. Opened up, the battens seem to switch pretty easily, but honestly, I didn't spend a lot of time looking up when I had the full sail catching wind. Looking up (when not moving) at that huge sail spurred an immediate sense of vertigo in the narrow boat... ha, I didn't do it very often. The two times I could have looked up when I was actually sailing... I didn't think about it. Here's a 'save' that I pulled from the video with the sail reefed to 22 sq. ft.. The fully reefed sail seemed a lot jerkier in the gusty wind, there is no doubt in my mind that had I not been on the upper edge of the coaming when this gust hit I would have gone over. As it was I came pretty darned close. Look at that leeboard, cool. Of note: 1) Much to my surprise I discovered the fully reefed sail to be a little calmer when I raised it high enough to clear my head (while sitting on the coaming). 2) The full 36' sail seemed to allow wind to bleed out of the top almost identically to the way the Kayaksailor does. This may be a natural effect of the batwing. I noticed it at both the 30' reefing and the full 36. I didn't see the 22' reefing dump that much wind out of the top. I was reading about windsurfer sails, today, and it was saying that they are designed with flex at the top of the masts so that, when the downhaul is tight, they easily spill excess wind at the top of the sail. A side benefit of this is that is lowers the center of effort on the sail at the most convenient moment. Since Balogh sails are allegedly based on old windsurfer designs, it all makes a bit of sense to me. I agree Chris. Greg was the first one I remember saying the KS dumped wind out of the top. Since then I've been trying to pay attention. The idea of lowering the center of effort while that's happening makes perfect sense. I just never thought of it that way before. Thanks! Greg and John will be happy to hear that I did get a chance to experiment momentarily with comparing speed on a heel vs. straightened up. Much to my surprise the boat did appear to increase in speed when I straightened her up from being heeled over. I was able to do it twice and both times there was an apparent increase in speed. I am new to this forum. Thank you for the pictures with the different sails. I have been kayaking for a number of years and am interested in getting into sailing with a kayak. After some research, I'm considering a MK I with a kayaksailor 1.4 or the 1.6. You show a 1.6 with the MK I . Any advice you could give me would be great. My first question is can you paddle with the sail up and/or down. I'm on the short side, 5 foot 5, and was hoping my paddle would be behind or under the sail when paddling. Can you lift and carry the MK I a short distance when assembled? How is your kayaksailor mounted? Welcome Ed. The MK1 + Kayaksailer is a great setup. 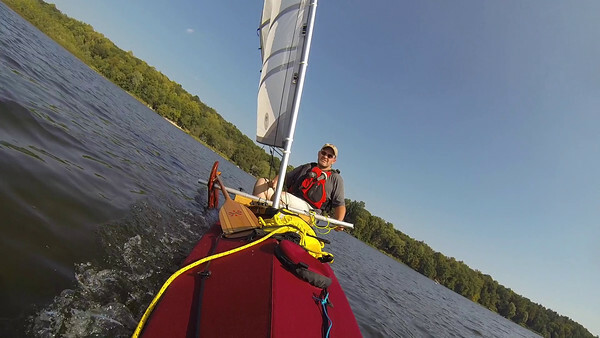 As Dennis points out, Gerald Grace at KlepperAmerica makes a custom mount for the sail and you can also buy the sail rig directly from Kayaksailer or from Gerald. I would go for the 1.6 + jib. You can always make less by reefing, you can never make more! I paddle the Klepper single which is very similar in dimension to the MK1. If anything the cockpit on mine is a bit shorter than the LongHaul. My experience is that I have to adjust my stroke just a bit if I use the traveler, so I ditched the traveler. The sail itself doesn't impede at all with my setup except when close hauled, and even then I can paddle as long as I watch the leeward end of the boom, not really a problem. It can get a bit messy with the jib and main sheets jumbled at my feet but it's manageable. Hope that helps. AFAIK Dennis is the only one here who has the exact setup you are asking about. Had good wind today on the lake although gusty as usual. Made a mistake and tried the BSD sail without the battens. It flapped around like crazy. Couldn't really use it in 36 sq. ft. mode, but worked better reefed down one time which is either 28 or 30 sq. ft.. Will put the battens back in next time. Put the battens back in, much better. Switched to the hand tiller, surprisingly... much better. Nice strong somewhat constant wind... much better. click on the pic for another short video. Note the pump, starboard side above and in the video - workin' overtime baby! Well Dennis in the video, although i don,t think i saw all of it you make it look like the outriggers should be on. If anyone saw me go over here it,s quite likely the lifeboat would be launched. Never the less a great video and the BSD outfit seems the way to go. Maybe a real sailer (and that counts me out) can begin to explain the dynamics at play, they are very complicated. But the way I have always thought of it is fairly simple. On a close reach the kayak will tend to heel the most without counter weighting. 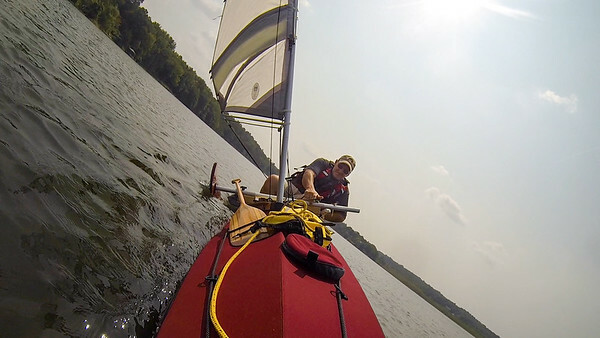 Under typical sail configurations the boat will want to turn to lee...that requires rudder input to keep the kayak headed upwind. That causes drag. You don't want drag. The more heeled the less efficient the rudder and, therefore, the more input needed and the more drag created (think of the rudder in the water positioned vertically vs. at a severe angle). So you will want to counterweight to keep the boat from heeling too much so that you get the most efficient bite out of your rudder. That said, some heeling actually helps put the boat into the wind and reduce the need for rudder input, think about it as putting the kayak on edge for a turn. But I think there must be limit to how much it helps. Any real sailors with input? Also, when you are heeled the airfoil (sail) is at an angle to the relative wind, which reduces it's efficiency. For those of you who also fly, think of how back pressure is needed on the yoke when in a turn. I just watched that swimming video, it is awesome. Wonder if you could learn to roll you LH with the sail. Hah! One of these days I'll have enough capsize videos to string them all together in an amusing short. It had seemed to me this rig on the MK1 had a definite and somewhat strong weather helm. But Greg's comments are making me rethink that a little. I seem to always have a little lean to leeward as that's the safest position for sailing. The counterweight of sitting outside the coaming is enormous. So much so that a pause in the wind is more dangerous than a stronger gust. I hadn't really considered the effect the lean has on the rudder. I had noticed that it was definitely harder to turn the boat one direction vs. the other. I often thought it was my water bottle stuck under the peddle or some other binding... Now I'm wondering if I wasn't fighting the force of water traveling over that rudder plane. I wish I could remember if the difficult side was consistent to one side of the boat, or consistent to one side of the weather. I will pay attention to that and try to compare it with being on an even keel. Also, as Greg points out, the lean to leeward will put the boat in an orientation to want to turn into the weather. So it's entirely possible the weather helm on the boat is not as heavy as I'd thought. This is good stuff to think about next time I go out. I'll second Greg's request for 'real sailor' input. John, I am impressed with the BSD rig. I really didn't think I would be, but I am. It's simple, and it works pretty well. Unfortunately the standard BSD mast does not fit the Klepper mast hole. You will need either an adaptor mast section or open up the hole by filing. I'd like to take my son sailing tomorrow in the AEII but I don't want to have to set up the S2 rig after having been spoiled by the ease of the BSD sail. How pathetically lazy is that? ha. A lot of people have been suggesting that I put the akas and amas on for this and that reason... I will eventually, but I want to say this: If you have a nice fresh water lake that's not too big, but big enough, and you don't mind getting wet... this sailing with the hike-out seat is one heck of a lot of fun. It's exhilarating, challenging, and at some point guaranteed to put an ear to ear grin on your face. I highly recommend it. Sail with the hike-out seat AND the amas. The objective is to keep those wonderfully high-mounted amas out of the water-- but if you don't, you won't get wet. Better yet: have your son do the hiking. I took my twin 7 y o s out and had them doing the hiking from the front cockpit-- worked a charm, and they had a great time. The amas were on, so no risk of capsize. The sponsons & gunwales support the weight of the kids on the side deck just fine.